The big screen adaptation for this classic science fiction character and universe which originally premiered in the comic strips of the 1930s originally was knowingly made to be a very campy and cheesy affair that drew heavily from the original source material – which was a double edged sword really. In this edition I am doing trying to remove or at least tone down the think layers of cheesiness that plague the production and leave it as a pure space adventure with just a bit of romance left in. The big screen adaptation of this classic space hero has long been one of the biggest let downs for me, a pulpy hero with roots in the 1930s when things were somewhat simpler was adapted in a movie for a new audience around fifty years after his debut and the results were very much a mixed bag. This edit presents the effort of heavily toning down the out of place humor that plagued the production and presents a streamlined adventure where an unwarrented invasion of Earth is fought back by an unlikely trio of earth people and the oppressed inhabitants of Mongo, the strange pocket universe ruled by the evil Ming the Merciless. My first motion menu, thanks a bunch Rogue! Flash Gordon was my very first exposure that what would become my life long hobby : big space brand science fiction. Back when i was around 4 or 5 years old I used to watch the re runs of the cartoon daily in the afternoons and became hooked. This eventually sparked my interest so much so that it later led me to the other great franchises which begin with the word ‘Star’ and the rest is history as they say. Not much later I found out that an actual life action movie existed I almost went nuts with excitement, and sadly I missed it on the theater due to a near typhoon which spoiled the appointed day combined with the very short time that the single movie theater it was shown at in my native city. The customes really were a throwback based on the originals and the characters were for the most part true to form. Vultan and his Hawkmen were spot on, and while a bit over the top they provided lots of entertainment. Ming is awesome as played by Max von Sidow. Flash now a football quarterback? He does visit Arboria and has lots of interaction with Prince Barin, but when the final fight of the movie takes place the rest of the treemen are nowhere in sight? And yet, all in all; this is the most accurate live action footage available that is true to the original material so I think that a little clean up job could help improve the experience quite a bit. - Completely remove the introduction of the film before the main credits, Ming no longer wants to conquer earth because he is ‘bored’, in fact we don’t get to hear/see him until Flash and the gang meet him at the throne room. - The classic Queen theme song is still very much featured, over the cool comic strip based credits. - Zarkov introduction downplayed a bit, with the silly humor from his assistant toned down. - Airplane conversations and action trimmed to avoid the romance taking hold too soon and to tone down the references towards Flash’s sports carreer. - Removed early Zarkov’s suggestion that Flash should lead a revolt without knowing whats really going on or can even trust him. - Throne room scene heavily modified : Dale’s jealousy is toned down, all mentions of introduction dialogue between Ming and Klytus about Earth are gone and the whole quasi football sequence is completely gone as well. - Whole scene with Flash is in Ming’s dungeon is completely gone. - Dale’s fainting during the execution has been removed to portray her as a more complete and strong character. - Bickering small people at Flash’s intended tomb site removed. - When Zarkov is subjected to the mind washing machine, Ming takes the trouble to explain what is going on? And Klytus expresses some admiration for Hitler? All cheese and all gone. - Telepathic conversation between Flash and Dale trimmed down to remove the most cringy and quasi romantic moments. - Dale escapes using some cunning, yeah ok cool; but then she becomes an acrobatic gymnast who knocks out guards with very fake hits? Trimmed. - Arboria, the whole initiation scene is ok, and exposes us some more to Timothy Dalton’s Barin; another highlight of the production IMO; and only Flash’s attempted escape and bump with a very fake looking swamp creature was modified. - “Bring me the bore worms/NO! Not the bore worms!” , “This place is a lunatic asylum” gone. - Flying city of the Hawkmen, trimmed to tone down the cheese of Flash and Dale’s reunion, no sudden marriage proposals and a bit of correcting a few errors during the spiked platform duel and removal of Klytus’ body melting. Also cut Vultan’s reaction and all the dialogue after the duel with Barin, it was pointed out how over the top it is. - Cut Aura and Dale’s pillow fight. - Toned down heavily the silliness during Ming’s forced wedding, all the nonsense is now gone. - Ending is pretty much untouched, removing the celebration tone was an issue for my previewers and I decided to keep it. Complete color manipulation to present a more pulpy / serial feel to the experience, thanks to Rogue for his expertise in this. 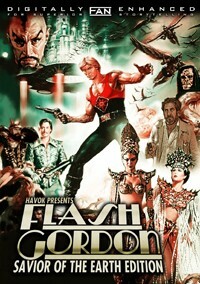 Overview - Flash Gordon was one of a fistful of films that emerged after the Star Wars phenomena. Many were rushed Hollywood SciFi scripts (eg: Black Hole, Meteor, Saturn 3, Battle Beyond The Stars). Flash took a different course, offering spoof over story. Camp more than special effects. The result was a mixed bag. Havok1977 removed much of the stupidity, making this a sleeker, less dumb version. He also heavily tweaked the original colour design. Video - Film played OK throughout. I did notice omissions, such as the football sequence, and the cut was abrupt. Maybe one or two others, but they flicked by with little splash. The red shift was noticeable for the whole film. Struck me as a mistake, especially for Earth parts. Also, the whole Mongo world was a glittering, technicolour extravaganza. Here, monochrome ruled. Note: Other editors forego menus. Had there been a separate award for menu design, this would have won easily. Great go-to example. Narrative - The plot holds. Pacing was quicker, to be sure. This edit is more intelligent than the original. The overall story remains childrens fare, but this child has a brain. Enjoyment - Acting splits between non-Americans who seriously seem to be having fun with the story, and Yanks who are clumsy and amateurish. In my book, Williams, playing Gordon back in 1974, was less wooden than Jones. Von Sydow is an unforgettable Ming. Havok’s version was a fun romp, delivering on the promise of what the original ought to have been. By all means, fans should hunt this down. Based on Havok's introduction, it sounds like we have kindred love affair with Flash Gordon. I was 10 when I saw the original, there was only one other person in the theatre besides my parents. It was like having my own private screening. And I loved every minute of it! At that age, I did not really notice the "cheese". To me, it was the ultimate in Space Opera Spectacle! Over the years, Flash Gordon has remained my all time favorite Guilty Pleasure Movie and I watch it repeatedly. But I have always wondered if there was a way to tone the movie down a bit and bring it more in line with its comic strip origins or the Buster Crabbe serials? And now I have my answer. And it is a definitive YES! The movie is still silly and loaded with bad acting but the extreme camp is mercifully toned down or completely removed. The core plot remains intact and still plays well. The cutting of Ming from the beginning is very smart, adds bit more drama and mystery. Though the cut from the starfield to opening credits is very abrupt, it should have been crossed faded or transitioned smoother. Sometimes when you know a film so intimately, it is hard judge if all the cuts are seamless or not. Unfortunately for me, there are many such scenes throughout -- Ming's Palace and football sequence is an example of one of them for me. As others have noted, there are a few audio dips and fades that are noticeable. I was not a fan of the colour correction. Too much red for my tastes, particularly during the Earth scenes. I think Havok successfully achieved his goals and has created a solid edit. I still prefer the original but this is a fast paced, entertaining alternate cut that I think Flash Gordon fans should definitely check out. Havok delivers a satisfying alternative version of Flash.